The blooms we give in celebration and in grief commemorate the same thing: life. For an artist and mother who presses and preserves them, those petals represent something else: hope. Six little Buddha heads, made of stone, act as paperweights on Sara Edi Boyd’s work table. “Oh, a friend gave those to me,” she says, delighted. “They’re perfect. Just the right size to hold stems in place without crushing them.” She sets one upright. 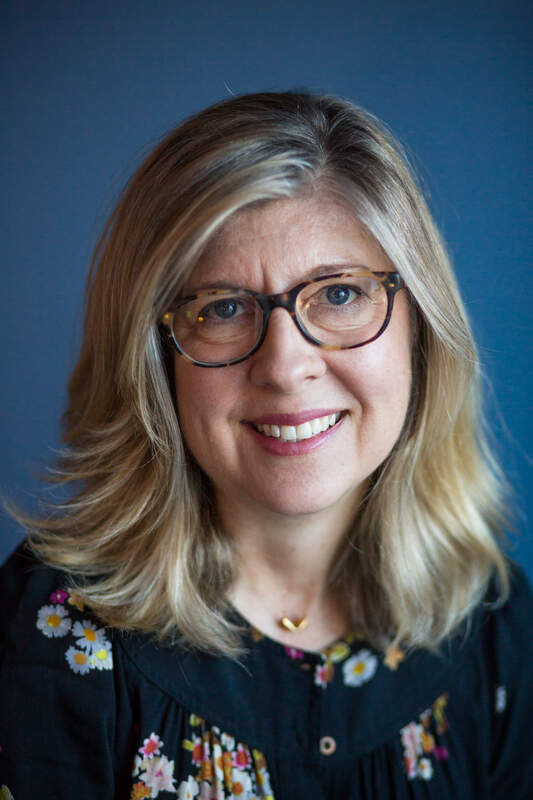 “See, the bottom of his head is flat!” The jumble of bangles on her wrists clink as she moves around her studio, Sweetgrass Botanicals, a cozy two-story warren behind her house in the historic Buena Vista neighborhood in Winston-Salem. 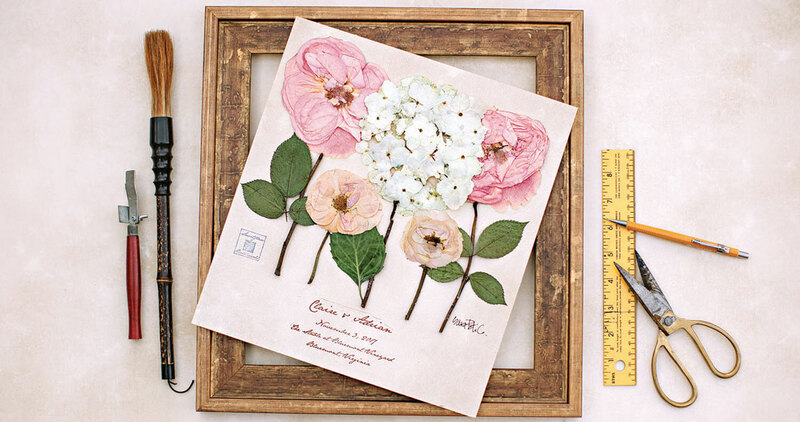 The small rooms open into each other, and are filled with stacks of plastic sleeves holding delicate, preserved flora, some pinned to cardboard, some loose, all piled beneath work tables and along brick walls and on shelves. Rows of flower presses bide their time until Sara deems their contents ready. Even the ceiling, papered with the illustrated pages of a 100-year-old Herbarium, is all about plants. “I used to feel territorial,” she says, appraising a cluster of tissue-thin hydrangea the color of seafoam. 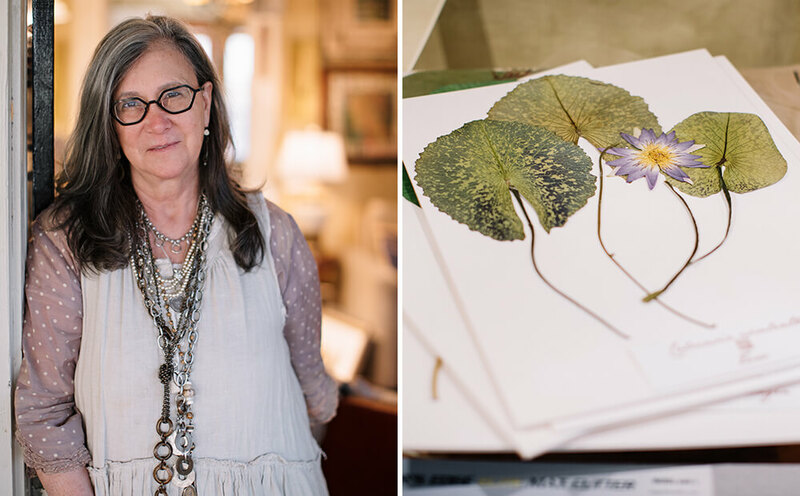 “I would love a piece so much, but now I do so many I can let them go.” Her pressed botanicals are collected by interior designers from D.C. to Charleston, and hang in stately homes and elegant offices across the country. In her hands, flowers that shouldn’t last a week are suspended in time: A peony holds on to its bright May blush, a magnolia its creamy complexion. A bullfrog orchid, pressed thin as velum, reveals a skin as intricately veined as a human hand. 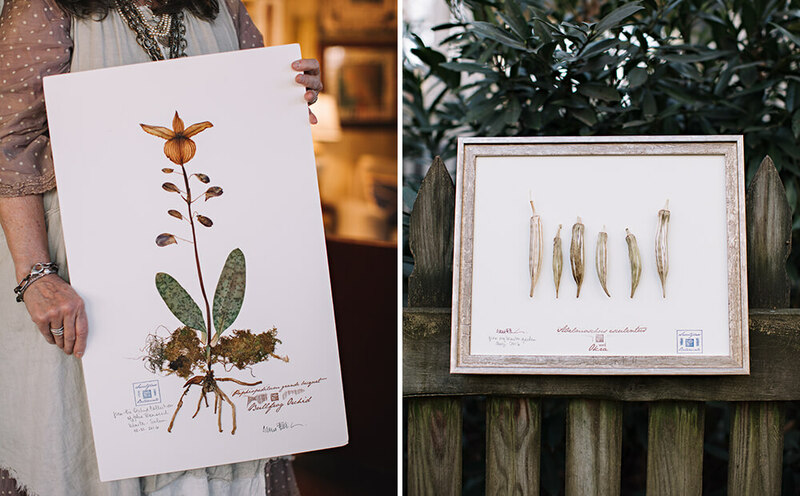 Removed from their natural landscapes and protected under glass, familiar plants are newly intriguing. 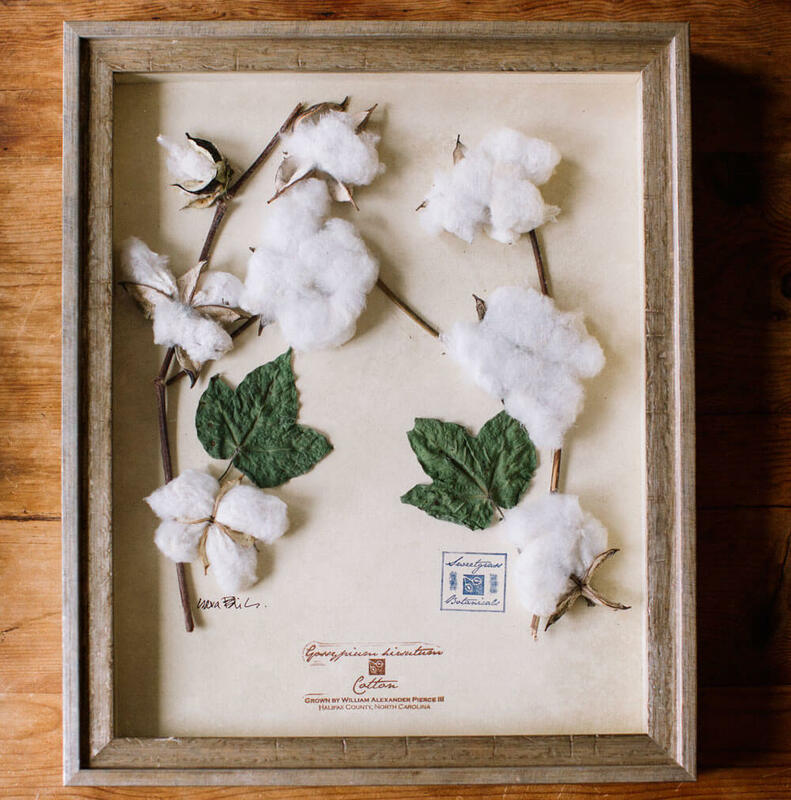 A framed tobacco leaf, part of a series on Southern cash crops, looks both tough and papery, the texture of a pocket-worn dollar bill saved and smoothed out. This leaf came from a tobacco farm in Caswell County, where Sara’s husband of eight years, Barry, grew up. He did have childhood friends who owned a tobacco farm, though, who let Sara take all she wanted. In return, she gave them each some bright leaf, pressed and framed. The farmers asked her to do a set for their sons, too. “I want them to see this like you did,” one of them told her. “As beautiful.” Understanding plants and their power to pull us back to a place, a feeling in time, is Sara’s sixth sense. One that’s helped her, and those she loves, find grace in life’s heartbreaks and lasting meaning in its celebrations. Valentine’s Day 2015. The day flowers are asked to speak up, to announce their intentions: roses for young love, peonies for old. Tulips for the newly smitten. A 3 a.m. phone call woke Sara. Her oldest son, Parker, was calling from Charleston to say that his brother Drew, a chef, had gone into cardiac arrest after work. By the time Sara got to the hospital, the 33-year-old was in a coma. First, though, Drew desperately needed one of the few available beds in a top rehabilitation facility, Shepherd Brain Injury Clinic in Atlanta. A “blessing of chance,” as Sara calls serendipitous moments, opened the door for him. For 32 years, Sara worked all over the country as a landscape architect, specializing in wildflowers and native plants. In the 1990s, while living in Atlanta, she designed wildflower gardens along the city’s bike and walking paths, many of which connected to one spot: Shepherd. As a child in her grandmother’s garden, Sara found kinship with flowers. “My sister Mary didn’t even notice a flower unless it was the same color as her lipstick,” she says, laughing. “But I could be entertained all day with my face in the grass, watching little ants.” The sprawling limbs of an old magnolia tree were Sara’s jungle gym, training her for later escapades in the mimosa trees near the river. Scrambling up into the branches, careful not to drop the book in her hand, she would settle in to read, with “the pink ballerinas of the mimosa all around me,” she says. The Secret Garden, read and reread, inspired her to become a landscape architect. In fact, in every project throughout the decades — designing outdoor public spaces from the Carolinas to Hawaii — she says, “I had to have a secret garden. 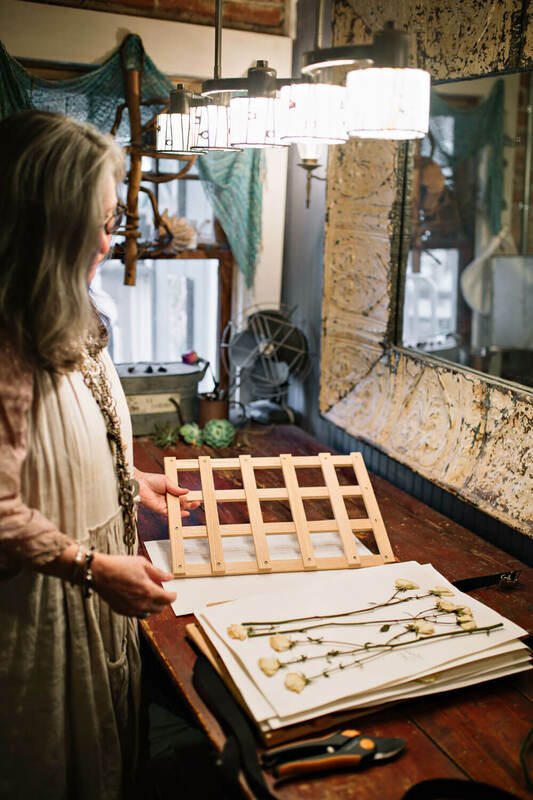 An area that was intimate, where, when you were in it, it felt like you and that little robin were the first ones on earth to see a crocus bloom.” After settling in North Carolina, she built another one: a water garden behind her studio. Season to season, Drew’s condition improved incrementally, but soon another crisis hit: Sara’s sister Mary was diagnosed with terminal brain cancer. “I couldn’t process why all this was happening at once,” Sara says. “But as my sister got sicker and sicker, she showed us how to handle it.” Mary’s best friend arranged a trip for the family, a grand finale of sorts, to the Maui Four Seasons hotel, with its 14 acres of groomed gardens. Sara shipped a case of presses to the resort so that she could pick and press flowers with Mary. Petal by petal, Sara dismantled the flowers for pressing. Now, Mary is preserved in the memory of that trip, and Margaret keeps her husband close in the orchids. Of all the native Southern plants that Sara has fussed over and tended to, her favorite flower is not among them. That distinction belongs to a bloom originating in South Asia: the lotus. “The important thing about a lotus is that it’s rooted in mud, and from the depths comes all that beauty,” she says. “When the petals shatter, there’s this amazing structure — this huge seedpod — underneath, supporting it.” In spring, when the garden behind Sara’s house leafs out, the pastel lotuses pop open in her quiet little pond. She presses a few for friends; an acknowledgment of all that life requires in exchange for all of this beauty. A lotus says it so simply. Like Mary is still with Sara. As Mary’s illness progressed, Sara asked her, “How do I do this without you when you’re gone?” Mary told her: You sprinkle my ashes in your garden. When you need my advice, you go out there with a glass of wine and look up in the sky and ask me, and I’ll tell you what you need to do. This spring, Sara will sprinkle Mary’s ashes among the water lilies and pickerelweed and lotuses in her secret garden. The sisters may talk about Drew and his hope to drive again. He lives in Charleston now, with some assistance, and cooks for 4,000 sailors and soldiers at the Naval Weapons Station. Or they may talk about their own mother, who moved to Winston-Salem to be close to Sara. Other challenges will emerge, no doubt, and Sara expects to rise to them.